I love early mornings. I enjoy watching and listening as the day begins. Today I observe an organized church/home scene that is deeply rooted in Ugandan village community culture. Older children are tending to the fires and assisting in the cooking as they are directed and taught by Pastor David's mother-in-law, Momma Margaret. Margaret commands the entire scene with knowledge and patience but also with respected authority. Younger children complete their assigned chores of sweeping, mopping, cleaning and sorting of beans and rice, hauling trash, cleaning shoes, and helping the smallest children as they dress into their school uniforms. As the smallest wait patiently for their morning meal before being driven to their pre-school, the older children, chores completed, now dressed in their school uniforms, grab a bite to eat and head out the gate walking to their respective schools. Cheerful voices of familiarity call out to each other in the security of the church compound as guard dogs nap and the day begins for 60 orphaned children living and functioning as a self contained village under the care and supervision of a loving church family. The last two days have been a time for the Arkansas short term team to grow stronger in purpose, unity, and focus. They have learned much through hard physical labor as they worked together to clean up around the Father's Devine Love compound. Due to ongoing construction there is dirt to be removed, bricks to be hauled, and windows to be cleaned. The locals are totally amazed to see "Mzungus" actually doing manual labor. It is a great testimony to the community as the team serves the home with their labor. Today the entire team visits two primary schools and one high school. We split into small teams of three or four and visit classrooms where we share our testimony and the gospel. The children welcome us warmly with songs of greeting. Part of the team does HIV testing at the high school and test well over 100 with no positives! Praise God! This evening, in a community outside of Jinja, the FDLM staff team sets up for another video outreach. Pastor David tells me we are in an Islamic stronghold as there is a very large Mosque nearby. Between 800 and 1000 wait on the open field. The warfare begins as the power generator dies and the jeers start. It dies a second time just before we prepare to deliver the gospel. As I present the gospel I can see numerous men and women in traditional Muslim dress. They are there for the video entertainment but they hear truth about Jesus. Many raise their hands to place their trust in Christ as the generator runs smoothly. As the movie about a pastor and a witch doctor runs I hear cheering for the name of Jesus and for good over evil. What a refreshing response from minds not polluted by Victoria's Secret and Viagra commercials. Minds receptive to truth, wanting to believe, looking for hope. A heckler yells "SNAKE" behind the crowd igniting a human stampede. Miraculously no one is trampled and the movie resumes on this spiritual battlefield. It was my plan to post pictures and comments daily but access to the Internet was spotty so I journaled instead. What follows are from my journal notes and memories. Of all the international trips I have made, this one ranks as one of the most memorial. What a blessing to see and participate in God's work in the lives of so many. 6:00 AM Father's Devine Love Ministries Jinja, Uganda. 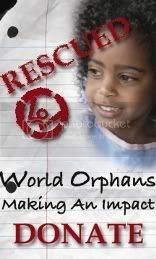 (A four year old World Orphans church/home that cares for 59 children ages infant to 18) The sound of a rooster crowing. The sky is just turning gray. Lord Bless our day! 10:00 AM I love the way my Ugandan brothers and sisters worship, sing, and dance. I love a church with no sitting room and people peering in every window. Kids everywhere...smiling, curious, looking at the American Mzungu's. Testimonies shared by shy teenagers on their first mission trip whose lives are being forever changed. Ah the benefits of leaving the comforts of home and seeing how the rest of the world lives! 11:00 AM I have the privilege of dedicating Pastor David Livingston and his wife Sarah's two month old daughter, Maranetha Livingston. Friday evening I watched a huge local fireworks display with my wife and our two dogs. We were amongst numerous families watching on a hillside overlooking an area lake. Children ran through the crowd with excitement and joy. Some did not even seem to care about watching the display. They were just having fun being outdoors with family and friends, secure in the knowledge that afterwords they would return to their homes of safety and comfort. The evening was a blessing of familiar sights and sounds. As I sat there enjoying the evening, I reflected on the fact that I would be traveling to Uganda in the next few days. Knowing that the sights, sounds and circumstances of the people I will likely encounter will be very different, I began to think about how richly blessed we are as a nation and as a people. May we never take for granted the freedom we have as a nation. May we never take for granted God's gift of family, children, and friends. May we remember those that do not have or enjoy what we have. May we give thanks and praise to the One who cared enough to die for us so that we could be adopted into His family. This morning I sat down to read some news headlines. Like many I get my news from several Internet pages. Below is one of the headlines I read on Yahoo. WASHINGTON - Is everything spinning out of control? Midwestern levees are bursting. Polar bears are adrift. Gas prices are skyrocketing. Home values are abysmal. Air fares, college tuition and health care border on unaffordable. Wars without end rage in Iraq, Afghanistan and against terrorism. The article continued reporting numerous newsworthy occurrences of a catastrophic nature. The reporting was accurate and one cannot argue with the facts. But what about our attitude and response to these facts? Are we to affirm the news reporters question, "Is everything spinning out of control?" I say emphatically, no! God has not lost control! He is the same today as he was yesterday and will be tomorrow. God is always moving forward with His plan. Instead of bemoaning our circumstances why not respond to our circumstances as the Apostle Paul did in Philippians 1:12-14 while in chains? Now I am no Apostle Paul, but I do sense that we have one of the greatest times in history to proclaim the gospel and name of Jesus Christ to a world that desperately needs a Savior. Maybe these current circumstances should be seen as God opening the door for His Church to be a visible expression of His love. Maybe we, The Church, like Paul, should view our circumstances as an opportunity to take advantage of? We can do so with compassion and care through our faith in Christ and by the power of the Holy Spirit.